Be Honest – How Clean is Your Shower? We are pretty sure there is no such thing as enjoying cleaning the shower or bathtub. However, neglecting the job can have pretty gross consequences. When these areas aren’t cleaned regularly and properly, it’s only a matter of time before they are stained, dingy, and look like they need to be replaced. If this were a world like The Jetsons, we could just push a button and voila! A new shower! Alas, that is not the case – and full replacement can into the thousands of dollars by the time you pay for a replacement tub or shower and all the labor needed to get it installed. Now the good news – there is another option that will leave your shower or tub looking just as sparkly clean as that brand new shower liner sitting on the store shelf. And, the cleaning and grout sealing can be done in much less time than a full remodel would require. Here in Galveston, we live in such a hot climate that mold can grow quite easily where moisture is present, and showers are no exception. Do you see orange-brown spots in the grout? That is likely mildew. If you see black spots, that could be black mold. Sometimes, products off the store shelves don’t have the mold killing power that a professional cleaning company can access. It’s also worth mentioning that some of those cleaning products contain harsh chemicals that really aren’t safe for regular use. The longer the mold goes untouched, the more embedded it can become within the grout. It’s probably not surprising that grout cleaning and resealing is less expensive than full grout replacement, but both are likely much cheaper options than full shower replacement. Showers and tubs not thoroughly cleaned regularly may also have bacteria present and be generally unsanitary. If you take a shower, then step out onto the bathroom floor, that bacteria is being spread. Okay, so that sounds a little cheesy – but really, what feels better at the end of a hot Texas summer day than hopping into a nice, refreshing, and clean shower?! Professional cleaning companies, like Made New Again, have years of experience doing shower restoration and use effective and reliable cleaning products to get the job done. These products, combined with professional tile and grout cleaning equipment, can reach deep into the pores of the grout and some tile, and release set-in debris. 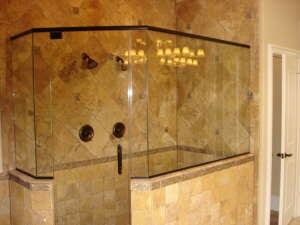 Save yourself money in the long run by having your shower routinely cared for by the professionals.